Mansfield Town's highly-rated defender Alex John-Baptiste has signed a new long-term deal at Field Mill. The 21-year-old had been linked with a move away from the Stags, and saw a switch to Crewe collapse, but has now signed a contract until June 2010. "Naturally I want to play at a higher level and I've re-signed in the belief that we will be challenging next season," he told Mansfield's website. 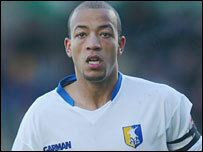 John-Baptiste has started over 150 games for Mansfield. He was ever-present for the League Two side last season.